A huge thank you to Megan Ann who suggested I put my yarn clippings in an empty glass jar with a lid to prevent Yarn Rascal from eating them. It worked beautifully. I was so much happier sitting in my chair weaving in sweater ends than I would have been sitting in my car in a parking lot. Every yarn end neatly tucked away. When Yarn Rascal first saw the clippings going into the jar he high-tailed it into my lap, walked over the sweater and proceeded to inspected the closed jar like a TSA officer inspecting a suspicious person. He could see the yarn clippings but couldn’t get at them. He poked the jar with his nose. He nudged it with his little head. He pawed at it. He tried to figure out how to get his jaws around it, all to no avail. Finally he turned his adorable little head and looked at me. My sweet, baby boy, Bichon had “this is war” look in his eyes. But his cuteness knows no bounds. He jumped off my lap and scampered up the stairs. Never a good sign when The Skipper and I are sitting downstairs. If he’s not on a terror mission he stays right beside us. 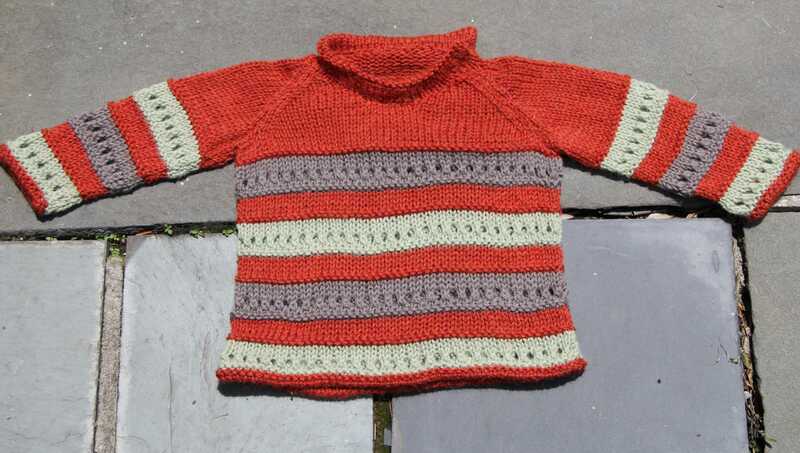 The hem of the sweater is knit in stockinette stitch with a garter st ridge. 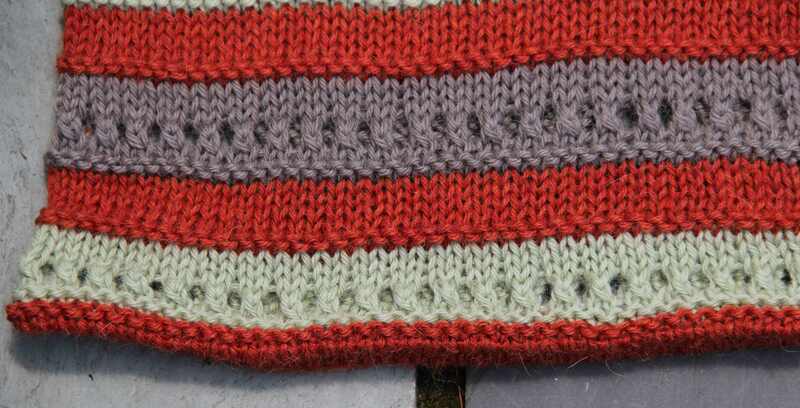 The hem is folded over at the ridge line and sewn to the sweater on the wrong side. Yarn Rascal stayed upstairs for maybe three minutes. We could hear him banging at the closet doors to the yarn vault, then he moved to the bedroom, where we heard a stack of folders hit the floor after being pushed off the night table. “Let him get it out of his system” I told The Skipper. After all the poor thing had his yarn world turned upside down. 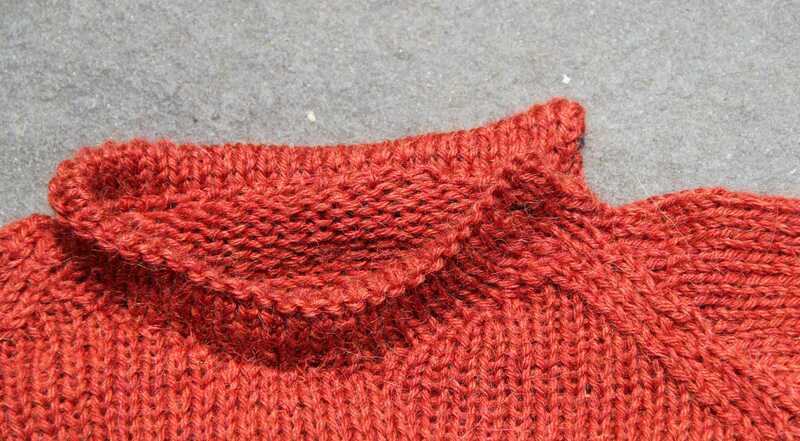 The neck of the sweater also gets folded in half and hemmed. 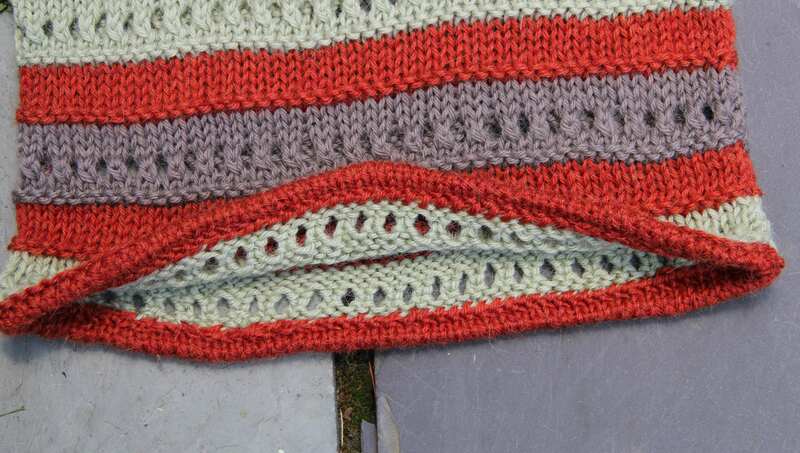 The garter ridge line adding just enough texture to make it look like small picots. The original designer closed the neck with a button on the side. I need to find a button that I like to completely finish it off. Yarn Rascal finally arrived back in the living room, a limp Mr. Dragon dangling from his mouth. I snipped two more ends of yarn, opened the jar, placed them inside, closed the jar. “You know you love Mr. Dragon” I told Yarn Rascal. “If you insist on hurting him I’m going to have to put him in a jar too.” I went to the kitchen and came back with a nice sized Mason jar, perfect for Mr. Dragon. I placed the jar on the floor. Yarn Rascal stared at his nemesis. He laid down by my chair and still staring at the jar proceeded to try to remove Mr. Dragon’s right arm. I plucked the toy from his mouth and popped it in the jar. I returned the closed jar to the floor. Yarn Rascal was angry, but chasten. In fact I felt really bad for him. He climbed up into my lap and pouted. I gave Mr. Dragon back to him and put the Mason jar away. Today I am rejoining Mr. Dragon’s right arm and left wing to his body. The sewing operation will take about 10 minutes and my assistant will be avidly watching the whole time. No more Mason jars for his toys. I don’t have the heart to do that to him. I will just stitch them back up until they can be stitched no more and then buy him new ones. He’s just too cute for words.